For the last year, I have been vermicomposting. I bought a cool kit off the internets: Worm Factory dumped a bunch of red worms and garbage in there and waited anxiously for the magic. While I waited, I occupied myself by strutting about telling total strangers how worms ate my garbage and envisioning a life in which I created an amazing super-worm that was capable of crunching its happy little invertebrate self through styrofoam and plastic waste. 1. People are freaked out when you tell them worms live in your kitchen. I happen to think that they’re kinda cute, burrowing around, chewing up my food waste and pooping it out, but apparently, this is not the case for everyone. Including my boyfriend, which is why they now live outside. 2. Worms have appetites, too! They like some things more than others, they eschew some things in a way I didn’t think worms could do (they are borderline snobby about garlic), and they can only eat so much in a day/week/month. That popping sound you just heard was my dreams of a zero-waste lifestyle based solely on my tiny worm farm vanishing like the first electric car. 3. If you live in Southern California, like I am blessed to do, you will be able to keep your worms outside. If you do not, you better hope you have tolerant housemates or a mudroom, because those poor little guys are not cold-tolerant. Even now, in California “winter”, they are sluggish and eat less than they do when its mild outside (I think I actually just heard someone snicker in New York…yeah, I know, our version of “winter” doesn’t even touch your nice “spring-like” day). 4. 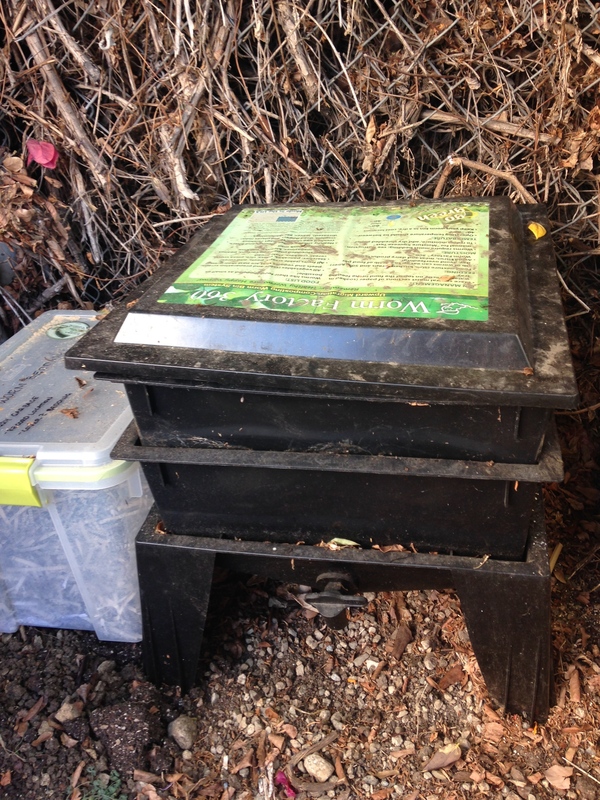 And most importantly, you may need more than just a single worm farm if you want to compost everything. I did. Meet my worms. They live outside in a fairly shady spot that is close to the kitchen. This keeps us motivated and cuts down on lazy disposal of food waste in the landfill bin. A bin of some kind: I used a pre-fab one for convenience, but then I turned around and built my own compost bin later (see separate post to come about “regular” composting), so what we can assume about me is that I’m stubborn and contradictory. Bedding: I use mostly shredded newspaper – black and white ink only…some heavy metals are still used in colored inks – junk mail, shredded cardboard, some dried leaves and twigs. Worms like their bedding soft, like Princess and the Pea. They also don’t like high levels of nitrogen, which dried leaves and plants have, so keep that to a minimum. This is a great way to use up old newspaper and all of those irritating junk mail flyers that you cannot ever seem to stop no matter how much yelling and protesting you do. Worms: You can buy them on Amazon! Or from your local gardening store. Uncle Jim’s Worm Farm is great – they package them nicely, they arrive alive, and they are prompt! And there you have it! I keep two trays of worms, and I feed alternating areas of the bin to keep them moving around. Plus it makes it easier to harvest if you know what is the most decomposed. I keep a log of where I last fed them and when, and any notes. I highly recommend the book “Worms Eat My Garbage”, which takes you through the ins and outs of compost that is too wet, worms that won’t eat, other creatures you might find in your bin, how to harvest, and other awesome tips and tricks. Here is my collection bin! It’s about to get much bigger, since we’ve discovered how many things are truly compostable. Here’s your first major tip!! 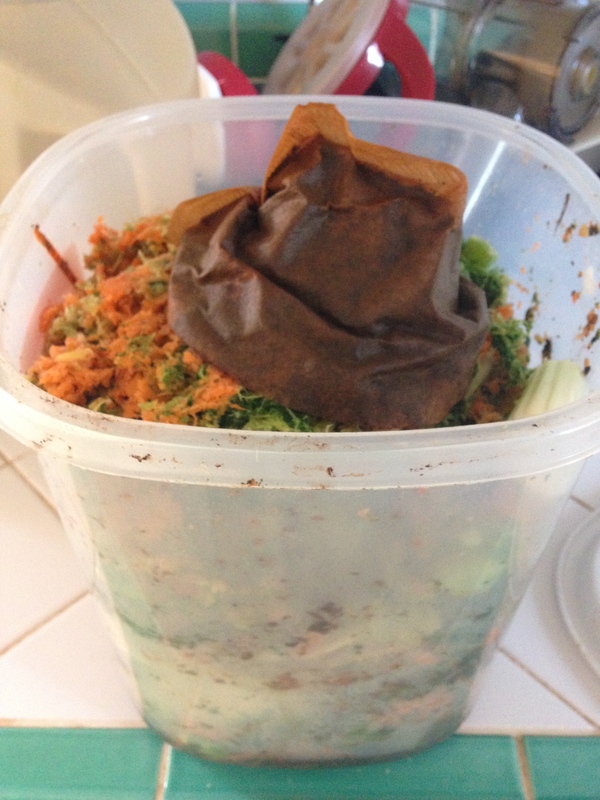 Make composting easy on you! Otherwise, it won’t stick. Don’t keep your collection bin outside in the barn where you have to put on your snowsuit, tie a rope around your middle (a la Little House on the Prairie) and risk losing a precious toe or two in the blizzard in order to collect your worm food. I’m exhausted just from writing that. I keep mine in the kitchen, under the sink, and I LEAVE THE LID SLIGHTLY AJAR. What does this do? It keeps it from stinking, believe it or not. The stink from rotting vegetables comes from anaerobic (without oxygen) bacteria production, so if you don’t deprive your waste of oxygen, you will not create undue stink. However, if you choose to only empty your container once of a month, do not come crying to me about the infestation of fruit flies and stink in your house. Leaving the lid ajar is not some sort of magic cure for all stench. Also doesn’t work for toilets, FYI. Here’s your second major tip!! Do your research and find a source that works for you. Some people have huge backyards like meadows, with unicorns galloping through them and children romping. I live in the middle of the big, bad city. The nearest meadow is in Yosemite, I think. I have a tiny side yard that I have transformed into an organic garden and a slip of a back porch. I can still compost. I can still garden. And so can you! Stay tuned for more stuff about urban gardening and small-space tips and tricks. Then I smiled a ghoulish grimace and tried not to panic. There was silence in the room. The interviewers frowned, puzzled, looked blank, then quizzical, then finally asked me to explain. I waxed poetic about vermicomposting. They thought about it a little more and then the light dawned, the storm cleared, and they thanked me for my answer. Well, color me surprised. And that’s how my adorable garbage-eating worms got me into grad school.